The rumors probably started before the mic cooled down after the final Black Album session. With each guest appearance and concert they snowballed until, finally, two weeks ago, the rumors stopped, because they stopped being rumors. As the man himself says, "the worst retirement ever" is over and fans can expect Jay-Z's 9th studio album, Kingdom Come, in time for the holidays to boost those 4th quarter numbers and keep Nas on his toes. While it was no secret to most, he definitely had some people fooled this time around. After running rap for eight straight years (and summers), Jay-Z did not release an album in 2004 or 2005, so it was definitely plausible that the retirement was official. On the other hand most people knew that he could not leave rap alone, because, after all, the game needs him. With the quality of lyrics at a low point, the Jigga Man may be embraced more than at any other point in his career. 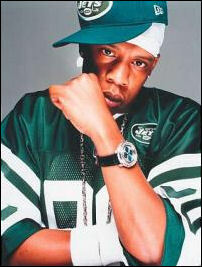 He is certainly deserving of the accolades, but blind admiration is going to hurt Hova in the long run. Jay-Z is the best rapper alive, and in the opinion of many (including this writer) the best rapper ever, but he should remain retired. "Hustlin' (remix)" and "Pressure" with Lupe are not up to par with the what should be expected of Jay. Perhaps he is saving his best rhymes for his album now, but a more likely scenario is that he is getting into his late 30s and cannot rap like he could when he was 25 anymore. The first time Jordan came back (you know the time with the 45) after baseball he solidified his spot as the greatest player of all time, but he was only 30. The second time he came back with the Wizards, he struggled to score 20 points per game and almost saw his career mark dip below 30 per game, because he was 38. Jay-Z's comeback will be somewhere in between Jordan I and Jordan II, but he should not accept anything less than Jordan I. A better sports analogy would be Oscar De La Hoya's recent return to the ring. Oscar used to earn $20 million a fight and he saved enough to start his own promotion company. Jay retired worth over $300 million and became president of Def Jam. For some reason casual boxing fans did not know that De La Hoya is going to the hall of fame, because it seemed like the hype exceeded the skills. That's when the "hating" started, and it is the same for Jay-Z. Since he sold a lot of records he got grouped with Nelly, Will Smith, 50, Ludacris, DMX, etc. All are entertaining and pretty good rappers, but they are not on Hova's level with Rakim, Biggie, and Pac. De La Hoya won his first comeback fight and made some pretty good money, and now he has the opportunity to fight Floyd Mayweather Jr., the best pound for pound fighter in the world. Unfortunately for Jay-Z there is no Mayweather, only rappers like Cam'ron who are not worth the effort it takes to train and put the gloves back on.